In each verse, an insect or animal larger than the one in the previous stanza hushes the smaller one. So the fly hushes the frog, the spider hushes the fly, the mouse the spider, the cat the mouse and so on. The book’s cumulative structure encourages kids to practice their memorization skills while becoming familiar with animals and the sounds they make. This bilingual edition contains an updated version of the original Spanish, a first-ever English translation and the musical annotation of the folksong. With animals, people and music whimsically depicted by illustrator Carolyn Dee Flores, this book will inspire a new generation to discover a unique cultural tradition. A graduate of Trinity University, CAROLYN DEE FLORES has worked as a computer programmer / analyst for Southwest Research Institute, Harcourt Brace Jovanovich and H.E.B. 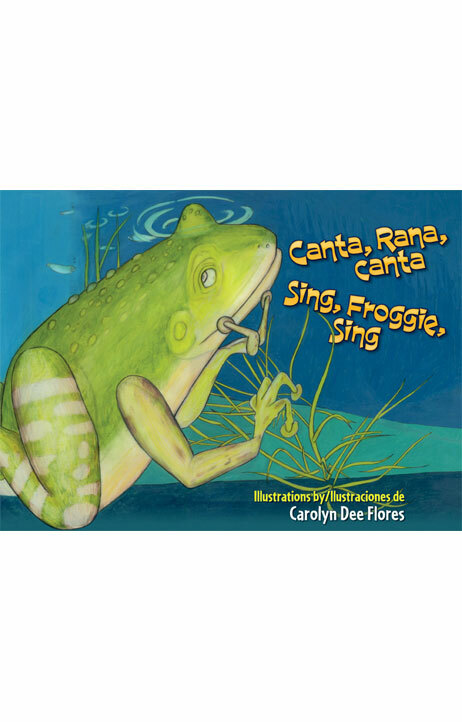 She is the illustrator of Dale, dale, dale: Una fiesta de números / Hit It, Hit It, Hit It: A Fiesta of Numbers (Piñata Books, 2014); Canta, Rana, canta / Sing, Froggie, Sing (Piñata Books, 2013), which was named to the 2014-2015 Tejas Star Reading List; and Daughters of Two Nations (Mountain Press Books, 2013), which won a 2014 Skipping Stones Honor Award for excellence in multicultural literature. A member of the society of Children’s Book Writers and Illustrators, Carolyn lives in San Antonio, Texas.